To turn on its genome — the full set of genes inherited from each parent — a mammalian embryo needs to relocate a group of proteins, researchers at the Eli and Edythe Broad Center of Regenerative Medicine and Stem Cell Research at UCLA have discovered. The metabolic proteins, normally found in the energy-generating mitochondria of cells, move to the DNA-containing nuclei about two days after a mouse embryo is fertilized, according to the new study, led by senior author Utpal Banerjee. Early in development, a mammalian embryo — or zygote — has all the materials it needs to grow and divide from genes and proteins that were contained in the egg cell. But after a few cell divisions, the zygote needs to activate its own genome. Researchers have never fully understood how this shift is made. They knew that certain metabolic compounds, such a pyruvate, were required, but had also observed that the mitochondria — which normally process pyruvate into energy — were small and inactive during this stage of development. 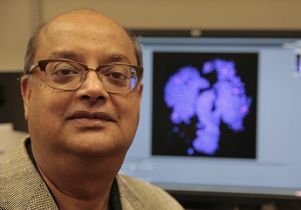 Banerjee, a professor of molecular, cell, and developmental biology and co-director of the UCLA Broad Stem Cell Research Center, and colleagues confirmed that pyruvate was required for zygotes to activate their genomes by growing mouse zygotes in a culture dish lacking pyruvate. Then, in both mouse and human embryos, researchers used a number of methods to determine the location of proteins that process pyruvate through a metabolic program called the TCA cycle. Just before the embryos activated their genomes, the two-cell stage in mice, the TCA cycle proteins moved from the mitochondria to the nuclei of cells, the researchers discovered. While mouse cells grown in dishes lacking pyruvate normally stopped growing at the two-cell stage, the researchers could rescue these cells by adding a metabolic compound that’s produced by the TCA cycle. Repeating some of the experiments in human embryos, they confirmed that the metabolic proteins move from the mitochondria to the nucleus just as the genome is activated — at the six- to eight-cell stage for humans. The importance of metabolic proteins to early embryonic development could affect future treatments for some types of infertility. In addition, the researchers hypothesize that some stem cells that have similar metabolic properties to early zygotes — including cancer stem cells — may relocate the TCA cycle proteins. Better understanding of the relocation could shed light on stem cell biology and alter cancer treatments. In addition to Banerjee, the first authors of the study are Raghavendra Nagaraj and Mark Sharpley; the co-authors are Daniel Braas, Fangtao Chi, Amander Clark, Rachel Kim and Yonggang Zhou, all of UCLA. The study was funded by an NIH Director’s Pioneer Award (DP1DK098059-04) and by the UCLA Broad Stem Cell Research Center.